Average 4.76/5 out of 17 total votes. HEROES OF THE ROUNDTABLE! 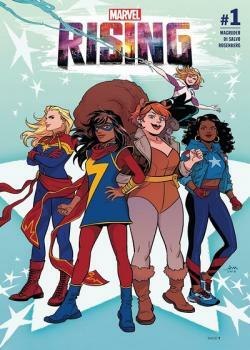 With the powers of GIRL and the powers of SQUIRREL on their side, Kamala Khan and Doreen Green are an unbeatable team! But that title is about to be seriously challenged — because New Jersey has been invaded by a swarm of knights in shining…suits?! Driving cars armed with javelins?! Uh-oh. Kamala and Doreen are gonna need allies to help protect their home turf — and they know just who to call. Don’t miss the return of the team-up that’s got everyone talking!